…Well, actually, we thought we’d cheer you up today, with happy tales of the outside world, and that magical land where fabulous creatures still hold dominion over the drab mundane everyday; where fauns and satyrs still frolic in the leafy vales, and warm limpid pools of lime jelly are positively teeming with carousing young scantily-clad cheerleaders [Editor’s note: Hang on, before you go off on one your sordid little flights of fancy, let’s at least have a little narrative consistency – if they’re so scantily clad, how do you know they’re cheerleaders, eh? ], with warm sun beating languidly down on their cheerleader’s uniforms piled neatly on the bank [Hmph!] 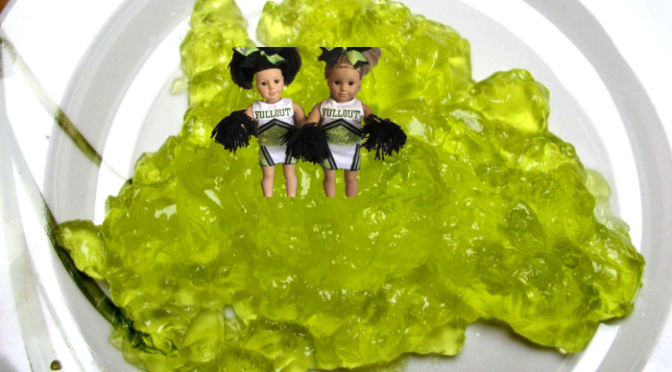 and the moist jelly glistening on their firm lithe limbs [Right, stop it, that’s enough – you’re banned! I hereby revoke your artistic licence; and since you already had ten points on it (writing without due care and attention, splitting an infinitive without indicating, and failing to stop when required to do so by a member of Her Majesty’s Grammar Constabulary) – that’s an automatic six-month ban plus a two hundred quid fine]. …My word, that one got weird a bit quickly, didn’t it? Ah yes; since we’ve had a couple weekends with no gigs to tell you about, we thought we’d take a break from writing these little missives; as you can see, the break seems to have done more harm than good. We have been busy though; after a few weeks rehearsing with our new prospective chanteuse, she announced that she has carelessly acquired a new job that requires her to be working on Friday and Saturday nights – and so, with a degree of stoic fortitude, we’re back on the lookout for a new singist. My beloved Lily will continue to admirably hold the fort in the meantime; but if you happen to know (or possibly even be) a vision of loveliness, with a voice that can charm the very birds from the trees, a deep knowledge of the entire classic rock oeuvre, and an enormous tolerance for gibbering buffoons, please get in touch. Preference will be given to applicants with an immediate family member who owns a brewery. It’s a slightly early start this one – 8:30 as I recall – and a very cosy pub (read “small”), but we always have a blast here – very appreciative crowd, and if I remember correctly, the beer is rather fine, too. And that’s all I’ve got time for this week – I must away, dear readers, for I hear tinkling peals of laughter coming from the garden, which means the lime jelly pool must be almost full, and my coterie of lovely administrative assistants are impatiently waiting for me join them.